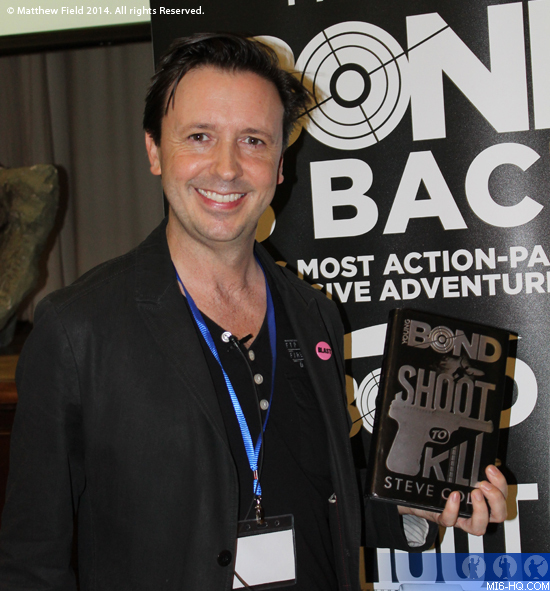 On Saturday 8th November, Steve Cole introduced a new generation of readers to the world of Young Bond. An excited and packed school hall in South London, listened intently as Cole read an extract from "Shoot To Kill" and delivered a light-hearted presentation into the world of espionage circa 1930s. Cole began by giving his audience an insight into Ian Fleming and James Bond. He revealed that he first read Ian Fleming shortly after watching 1985's "A View To A Kill". He read the short story on which the film is based and was surprised to discover how different the literary Bond is to the films. "My favourite Ian Fleming book changes to be honest with you. My favourites are 'On Her Majesty's Secret Service' and I like 'Casino Royale' - there is an extra darkness in that one." Cole discussed the joys of working with the Fleming family, who incidentally told him, this week they had just been invited to read the script of Bond 24 in a very secret location! The author recalled the 'audition' he undertook to become Charlie Higson's successor. "I went in and discussed my initial ideas, then I had to write some sample chapters and a synopsis. Then I met with the Flemings and they interrogated me!". Cole was in a hotel room in New York when he received the call to say he had the job. "It was suitably Bondian, to look out over Manhattan skyline thinking I was going to write YoungBond. And then I had to keep it secret for months and months. I was writing it in secrecy.". Cole's Bond adventure begins in 1934. Thrown out of Eton, young James Bond briefly attends Dartington Hall, a progressive school in Devon. Here he makes new friends and enemies before leaving the UK for a most extraordinary field trip by zeppelin to Hollywood, Los Angeles... where deadly challenges await. "This is the sixth YoungBond. The sixth adult James Bond novel is "Dr. No" which they launched the film series with, so I thought maybe YoungBond's sixth book could go to Hollywood in a different way." . Cole wrote a large proportion of "Shoot To Kill" in Sitges, Spain while on a book tour. "I didn't have Internet connection and I wrote so much faster!" 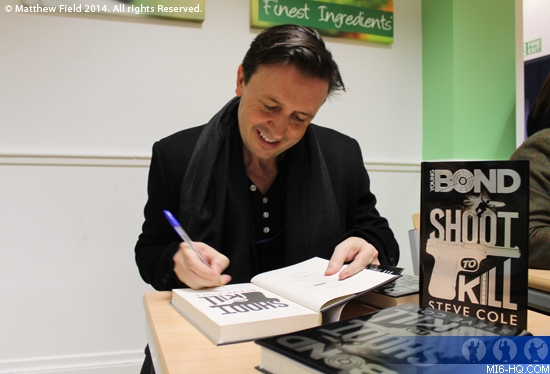 He's immensely proud of the finished novel, "I have spent more time on this book then any other so I'm very pleased and happy it's out there." Cole is currently writing his second Young Bond novel in a four-book deal. Following the presentation, Cole happily signed books and discussed the world of Bond further with his avid young readers. Many thanks to Matthew Field and Brian James Smith. All photos © Matthew Field. All rights reserved.